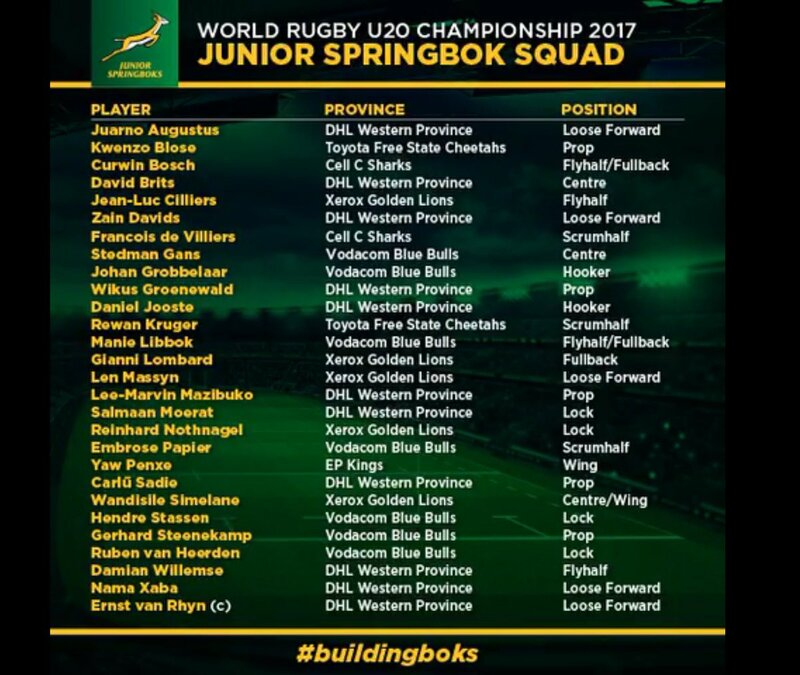 South Africa have announced their squad for the upcoming U20 World Rugby Championship in Georgia. The team, coached by Chean Roux, is dominated by Western Province and the Blue Bulls, and features only two Sharks representatives- fly half Curwin Bosch and scrummie Faf de Villiers. Skipper Ernst van Rhyn, Bosch, Props Kwenzo Blose (Free State) and Carlu Sadie (WP), Blitzboks Zain Davids and Stedman Gans, scrumhalf Embrose Papier and versatile back Manie Libbok are the survivors from last year’s squad. Lions wing Madhosh Tambwe, touted by many as a future star to watch out at the Junior World Cup, missed out on selection because of passport issues.